Crumely delicious crispy ciacha with pieces of chocolate without the gram of sugar. 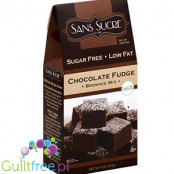 For those who love sweets and chocolate and want to enjoy their taste by limiting sugar. Weight net. 130 g.; 10,37 pln/100g. 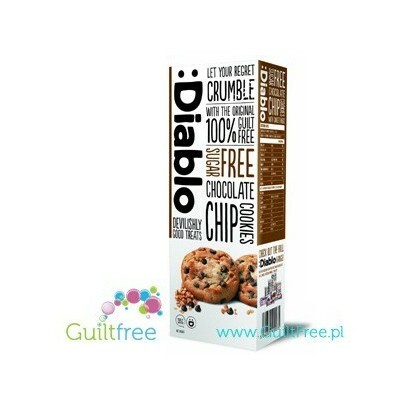 Aromatic, intense flavored biscuits with chocolate drops are a real delight for the palate. Their deep taste makes them perfectly satisfy the desire for sweets despite the fact that they do not contain a gram of sugar. The exquisite taste is due to the use of exotic shea butter for baking. 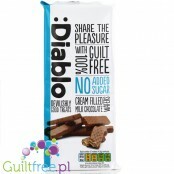 Compared to a regular cake of this type *, a shortbread Diablo with chocolate pieces has 12% less calories, more than 40 times less sugars, 6% less fat and 12% less sodium! * In comparison to Milka XL Cookies Choco. 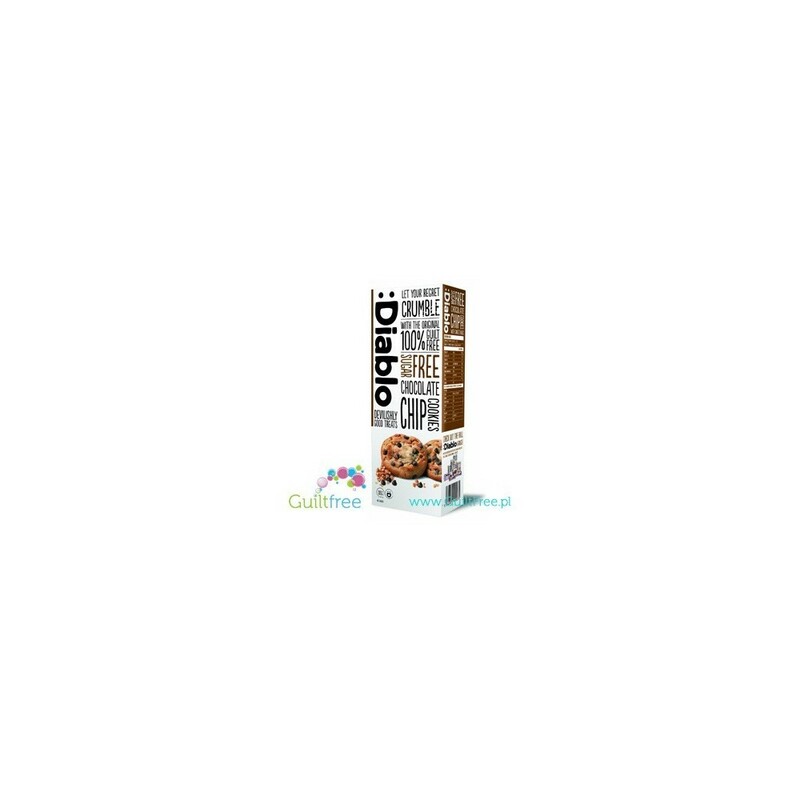 Ingredients: wheat flour, chocolate droplets without sugar (37%), emulsifier (soybean lecithin), reduced fat cocoa, natural vanilla flavor, partially hardened vegetable fats (palm oil, shea butter, soybean oil, rapeseed oil), sweetener maltitol, eggs, oat flour, leavening E500, salt, aroma, cocoa. Contains a sweetener: maltitol. Excessive consumption may cause a laxative effect. Contains low-fat cocoa. Allergens: the product contains soy, wheat, oats and eggs. The product is packaged in a plant in which nuts, including peanut, and milk are processed. Deliciously crispy crispy wafers layered with a creamy mass, covered with a layer of delicious milk chocolate, with reduced salt content and no added sugar. The low-calorie vanilla Krunchy Melts are sweetened with xylitol - they do not contain sugar or fat. They delight in wonderfully vanilla flavors and are as fragile as traditional sugar meringues. Complete mix for vanilla protein ice cream - you only need a mixer and glasses of cold water, you do not even need an ice cream maker! 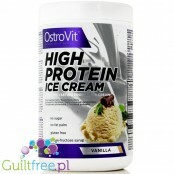 High protein, low fat ice cream Ostrovit in over half consist of protein! Creamy Vanilla & Caramel.OhYeah! have the opinion of the world's most delicious protein bars - bite and you'll see why it is and understand what their name means!Zero trans fats, sensational taste and high quality ingredients including 28g of highly-digestible protein - all this makes up the legend of OhYeah! Skinny Noodles are low-calorie, they contain only 6.4 kcal in 100g of product, it is free of fat, sugar, gluten, soy and eggs, so it can be consumed by allergy sufferers, vegans and vegetarians. 100% natural composition. 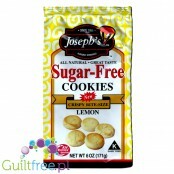 Delicious, fragrant, Joseph's biscuits do not contain any sugar. 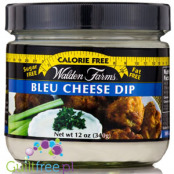 Perfect for those who love sweet cookies and want to enjoy their taste while limiting sugar.